another thing that my church knitting group does, besides these blankets, are scrappy prayers shawls. the fun part for me is that they nearly always come out of my stash… so i get to coordinate the colors and throw in odds and ends of everything. this is perfect for working with smallish amounts of handspun etc. 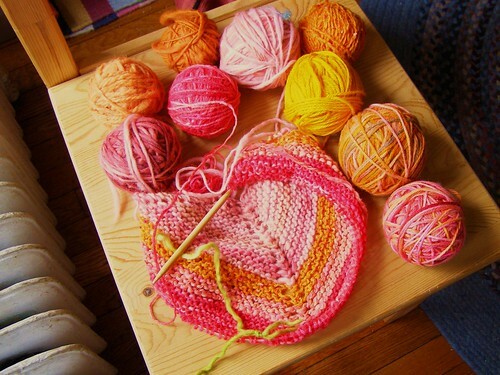 in my opinion, having several textures and kinds of yarn is key. click through the picture to flickr to see what yarns i chose. the other thing about these shawls is they can be passed from person to person and knit on by many, while still looking great. get a pile of yarn. for this one, my pile ranges from bulky to worsted. choose a needle size. we’re using a 10.5 US (6.5 mm) 24 in. circular. i usually do somewhere from 9-11 US. 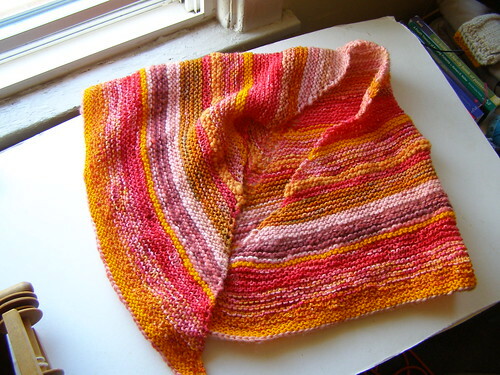 you may want to mark the bold knit stitch – it is the center stitch in the shawl. repeat these two rows until you think it’s big enough or run out of yarn. change colors as needed/wanted. be sure to bind off loosely! to switch to stockingnet, work WS purl instead of knit. to make it even more fancy in the stockingnet version, work the first row of a new color as a WS knit, to create a garter ridge. 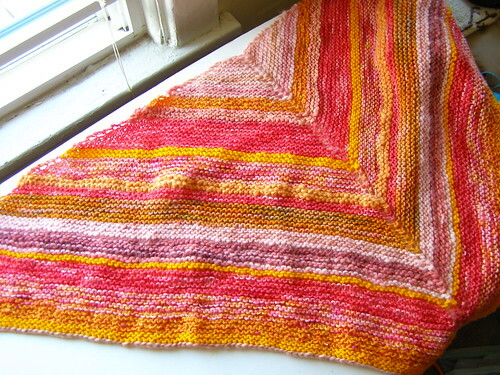 EDIT: i did complete the shawl – so photos! p.s. i cannot promise that you’ll see this shawl completed. we often give them away right when we’re done and, as you can see, i already did my part of it. p.p.s. not everyone wants a scrappy one of these… if the person is deemed more sophisticated, i usually recycle a sweater and we make theirs all one color ;) but the scrappy ones are our favorite to make. Me too! Love the color combinations. What a great way to use up yarn scraps. I have to say that I love the color combo, it looks like a ‘happy’ bunch of colors. putting these together was fun. i asked the woman’s mom and she said, immediately pink! orange! and so we have a fabulous color scheme. My knitting group does prayer shawls also. This is such a great idea. Thank you for sharing it. haha. that’s totally funny :) and thanks! I love this! The colours are great. I stumbled upon your blog last week and really like your projects and have been admiring your yarns. I made something similar, which I posted on Ravelry, however I had a hard time with weaving in the ends of colour changes in a nice manner. Any tips? Thank you Cosette for posting this. I’m going to share this with my charity knitting group in NYC. We’re planning on knitting for the elderly this spring! love your simple shawl (so new knitters can join, too! ), super cute, and wonderful as a prayer shawl. Mine will be bluesy greensa dash of purply and smattering of pink. Love using up yard bits. Love a prayer shawl. Thank you! It’s now 2017.